The 49ers, comprising of Jas Mace and Marchitect and hailing out of Newark, Delaware, are not two wanna-be football stars from San Francisco. These two hip-hop entrepreneurs have been blowing up clubs and venues across the country since 1995 when they where the focal members of the hip-hop conglomerate The Outfit. The Outfit’s first release, The Soundtrack to Life, had national distribution and received positive reviews from radio D.J.s and critics across the country. Their first 12 release was titled Beauty of the Week and remained on the college rap radio charts for over 12 weeks. Due to a string of unfortunate events, The Outfit has since dismantled but The 49ers have continued recording throughout the years working on various solo and group projects. 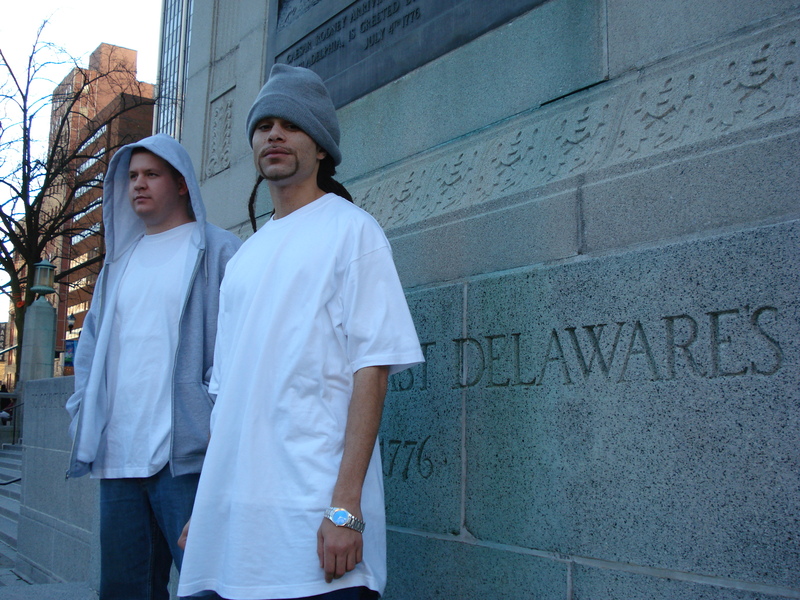 They have been featured at the 2006 Allhiphop.com’s Breeding Ground showcase and won Delaware’s best Hip-Hop artist of 2007 in Out-and-About Magazine. The 49ers have also starred in, and produced the soundtrack to, the award-winning documentary called Guilty or Innocent: Use of the N Word. In 2007, The 49ers released their first Japanese album titled State of the Art and was well received in Japan. State of the Art was more of a 49ers’ greatest hits and unreleased album as it contained unreleased songs recorded by The 49ers, as well as a collection of their greatest hits released as The 49ers and The Outfit. In 2009, they released their second album titled The Ultrasound. The Ultrasound was the first album that wasn’t produced entirely by The 49ers. The Ultrasound featured producers from around the world and was also well received as a breath of fresh air to the current state of hip-hop. In 2010, The 49ers were featured on Re:plus’ album called Everlasting Truth. The song “Imagine” was the #1 hip-hop single on iTunes Japan for two months. The 49ers followed up their hit single and charted again on iTunes Japan with their song “Running Out of Time,” which is featured on Incise’s album called Daily Methods. The song is also featured on the compilation album called In Ya Mellow Tone 5 and peaked the charts at #72 on iTunes top 100 hip-hop songs inJapan. In 2011, The 49ers charted on iTunes top 100 hip-hop songs in Japanwith “Music Plays On.” The song is featured on In Ya Mellow Tone 6 and is also included on Thomas Prime’s album called Waiting for Tomorrow. “Music Plays On” peaked at #97 on iTunes top 100 hip-hop songs in Japan. The 49ers released their 4th album titled Musaic on Libyus Music. The album’s title is a play on two words – music and mosaic. Marchitect explains, “We wanted all the songs to have their own flavor and color, but to come together and make a complete picture. Like a musical mosaic, hence Musaic.” The album was primarily produced by Soulchef and received great reviews across the internet. Also in 2011, The 49ers released their second album of the year titled Soulstice on Green Piece. This was a collaboration album with a Japanese production unit called ZDW!? (Zaa Dee Woo!?). Soulstice has a unique flavor and is a blend of Japanese traditional sounds, hip-hop beats, and jazzy instruments throughout the album. The album’s theme is based on the summer solstice, hence the album’s title. Soulstice casts a wide net of concepts ranging from needing a vacation, reuniting with ex-girlfriends, and the inevitable end of all good things. The 49ers hit the iTunes charts again in 2012 with “Doc Ellis,” a track that is featured on Blazo’s album called Reflections. “Doc Ellis” peaked at #66 on iTunes’ hip-hop charts inJapan. With the success of “Doc Ellis,” The 49ers have now charted on Japan’s iTunes top 100 hip-hop charts each of the past three years. Also in 2012, The 49ers released their 6th album called The World Record. The 49ers called their album The World Record because it’s true to their mission of spreading quality, authentic Hip-Hop throughout the world. The album features producers and artists from Korea, Japan, France, United States, England, Jamaica, New Zealand, Taiwan, Australia, and Poland – truly making this a world record. The World Record features the platinum selling Hip-Hop legend Positive K, as well as popular Japanese Hip-Hop group Samurai Troops aka SMRYTRPS. The album has a unique blend of concepts, turntablism, metaphors, live instruments, and foreign languages. would you guys say you’re more popular in japan than in the states now? It’s like hip hop’s dead over here!